Two stage dimmer, 20 lumens. Uses 4 AA batteries (not included). Secure keyhole mount and drywall anchor included. Mounts anywhere, adhesive backing. 13.5 lumens. Tapping the center of the light turns it on/off. Uses 3 AAA batteries (not included). Mounts anywhere, adhesive backing. 13.5 lumens. Tapping the center of the light turns it on/off. Uses 3 AAA batteries (not included). Weatherproof, motion sensor, outdoor/indoor. Easy installation, no wiring. 42 lumens. 4 AA batteries (not included). Detaches from its mounting plate to serve as a handheld light Versatile, extra bright. 40.5 lumens. Included adhesive strips and integral mounting bracket. Once installed, the light can be detached from the bracket for handheld use. Uses 3 AAA batteries (not included). Versatile, extra bright. 40.5 lumens. Included adhesive strips and integral mounting bracket. Once installed, the light can be detached from the bracket for handheld use. Uses 3 AAA batteries (not included). Fulcrum Tap Light, Versatile, Series: Light-It, LED Bulb, 9 Bulbs, Flood Beam, 40.5 lumens, 100000 hr Average Life, Alkaline Battery, AAA Battery, 3 Batteries, White Body, Includes: (3) AAA Batteries, For Any Dark Space, Closets, Cabinets, Boats, Rvs and More Portable, mounting bracket, motion or on/off. 65 lumens, 3 AA batteries (not included). Comes with an adhesive strip and optional angled mounting bracket enabling it to be installed anywhere. It features an optional motion sensor, and detaches from its bracket for hand-held use. Broad beam of light. Motion-sensing light casts a broad, bright beam. It comes with a mounting bracket to attach it to decks and walls and a detachable stake. Weatherproof, outdoor/Indoor. 42 lumens, 4 AA batteries (not included). 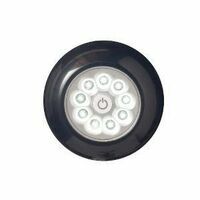 Fulcrum Porch Light, Adjustable, Wireless, 6 V, 25 ft Sensing, 100 deg Sensing, LED Lamp, 6 Lamps, Battery Power, 42, 5-1/2 in Overall Height, 5-1/2 in Overall Width, Plastic, Bronze, Includes: Mounting Plate and Hardware, Weatherproof, For Home and Office Fulcrum Porch Light, Adjustable, Wireless, 6 V, 25 ft Sensing, 100 deg Sensing, LED Lamp, 6 Lamps, Battery Power, 42, 5-1/2 in Overall Height, 5-1/2 in Overall Width, Plastic, White, Includes: Mounting Plate and Hardware, Weatherproof, For Home and Office Motion sensor ceiling light. On/off timer. 125 lumens. 3C batteries (not included). Motion-sensitive light. Installs nearly anywhere with screws or drywall anchors (included). No wiring or plugs required. 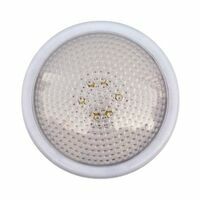 Wireless, use alone or with wireless remote control LED lighting system, remote control not included. 125 lumens. Uses 3 C batteries (not included). RF Technology works through walls. 35 lumens. Lights use 3 AA batteries (not included), Switch uses 2 CR-2032 batteries (included). Operated by a wireless remote switch which functions up to 60 feet away. Up to 20 lights can be programmed to operate on one switch. 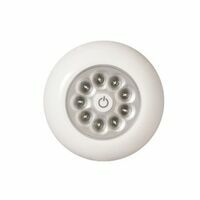 A dimmer is included, and the lights automatically turn off to save energy. 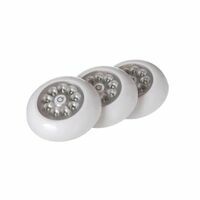 Weatherproof housing and motion sensor, wireless, adjustable. 5 minute installation. 275 lumens. 4 D batteries (not included). 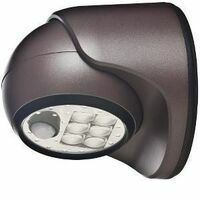 Weatherproof housing and motion sensor, wireless, adjustable. 5 minute installation. 275 lumens. 4 D batteries (not included). 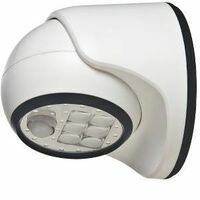 Weatherproof housing and motion sensor, wireless, adjustable. 5 minute installation. 275 lumens. 4 D batteries (not included). RF technology works through walls. 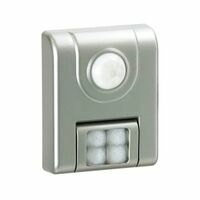 Up to 20 lights can be linked to the same remote control switch. 125 lumens. Switch uses 2 AA batteries (not included), light uses 3 C batteries (not included). Features a variable dimmer and an automatic battery-saving shutoff.